In this episode, we explore the life of St. Marguerite D’Youville, courtesy of an excerpt from Maria Morera Johnson’s new book: Super Girls and Halos. 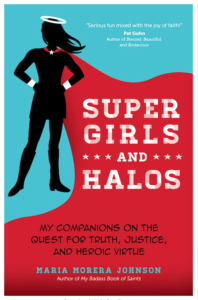 What’s more, we’ve got a great conversation with Maria Johnson about this fun book that is a mash up of heroines from books and the screen as well as the communion of saints. This is a wonderful title that I’m happy to endorse.